I think the garden might be…done? My last post about our back garden was 8 months ago, and something unfamiliar and weird seems to have happened: We’re finished. I mean, nothing is ever really DONE, of course, and it’s a garden so (hopefully) everything will continue to grow and change and need to be maintained, but I’m calling this a complete project. WOW. Clocking in at 7+ years, the world’s longest landscaping project involving a tiny plot of land has come to a close. The garden is now officially a nice space where we can hang out and have guests over and not apologize for dirt mountains or dangerous holes waiting to break ankles or swallow Chihuahuas. We finally got some plants into the recessed planters we built last summer (each is just four boards stained black and screwed together at the corners). I had some ideas about the types of plants I wanted to use based on Susan Welti’s garden design for Carin Goldberg and Jim Biber, but I let my eyes and my wallet be my guide when it came time to buy. Fortunately, our local garden center was running a big sale on ornamental grasses, so we were able to pick up four large dwarf maiden grass plants at a good price. We also bought four variegated Solomon’s seal plants, which we’ll have to be patient with and allow a couple of years to fill out. Check out those HUGE spirea bushes in the mega-planters!! They were so teensy when I planted them a couple of years ago. Everyone said they would die during the winter if we put them in planters, but my mother thought they’d be fine, so I went ahead and took a chance. I love them. I’ll probably fill in the planter a little more with some annuals next spring, because the garden could really use a little color to break up all the green. I wound up having to take down my homemade Woolly Pocket-style planter (I don’t think I ever blogged about it, but you can kinda see it in these photos) because some industrious squirrels decided to turn the felt into nesting material. Oh well! I really liked having plants on the fence, though, so I ordered four of the new hard plastic Woolly Pocket planters to put to use in the spring! I could put them up now, I guess, but plants are expensive and I want to get a full season out of them. 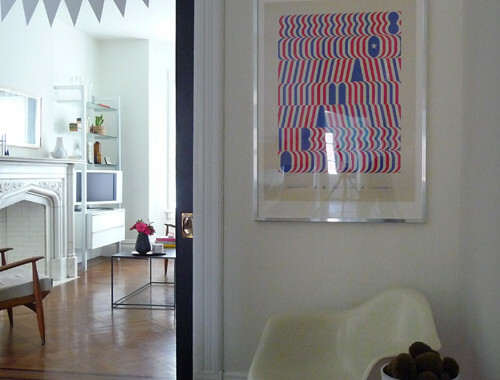 Lance Wyman poster & New Year’s bunting. It looks amazing! Congratulations on calling it a day. Gorgeous! I need to copy that deck. I love it! 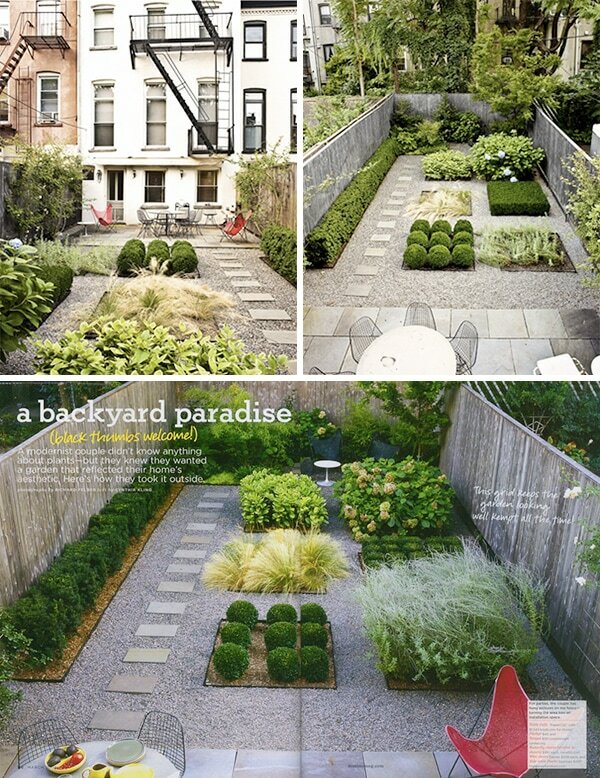 When I have a backyard, I want it to look like this. Looks great! Love how the creepers are filling in between the stepping stones. Looks COOL! What about planting some bulbs this fall? 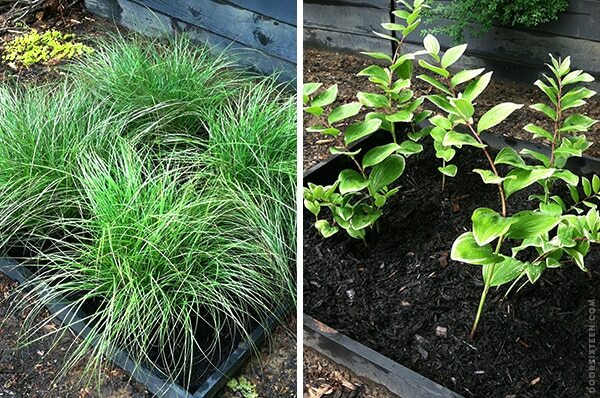 They are pretty cheap, easy to plant, and are a nice surprise in the spring. And they come back every year with little fuss. And if you don’t like them, dig them up and give them to a neighbor! 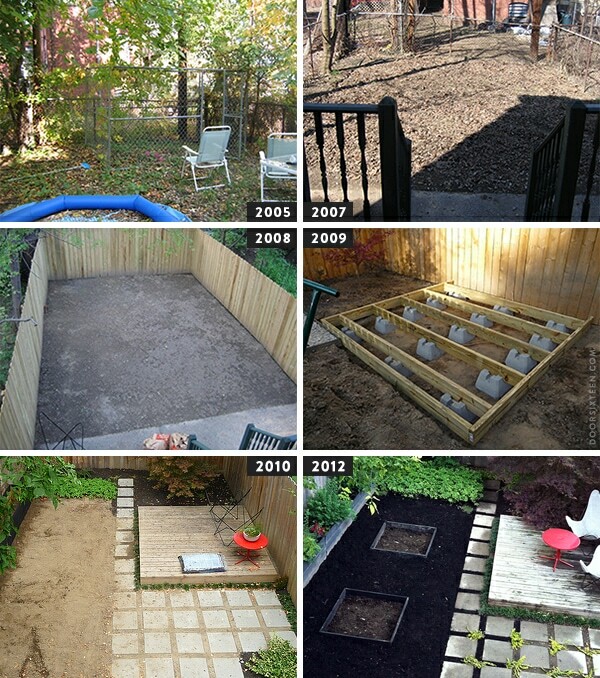 This actually gives me hope that we might one day tackle our backyard too. 2.5 years in our house and we’ve been too busy with the inside to do much to the outside, besides keep it from overgrowing. Yay for very slow, steady progress!! That’s exactly what I’m looking for after seeing nothing but ugly plastic ones. I would DIY if I had the time on my hands. Thank you! I’m going to order that one in a couple weeks. Anyway, everything else is looking stellar! Sherri, that compost bin has been GREAT! 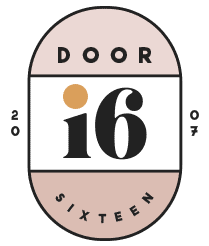 I wholeheartedly recommend it — super durable AND it looks good. The garden looks soooooooooo good. Those grasses! It’s such a nice place to hang out, too. Looking around this space and adding up the amount of crazy manual labor and work that went into it—I’m a little in awe. I’m going to need your help picking out plants! Man, it looks so GOOD! I love it and want to hang out there. I really love the stuff growing through the tiles – what is that? Also, it’s amazing what a big difference a good fence makes. We’ve been looking at a few houses that have the most awful corrugated iron fences and it just looks so trashy and unwelcoming. 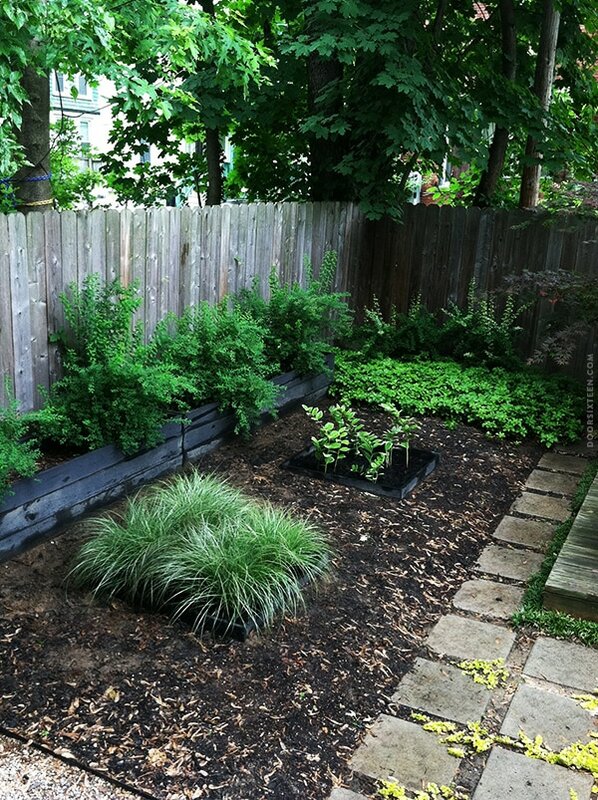 As soon as that fence was added it started to look like a welcoming space to spend time in! Thanks, Becka! 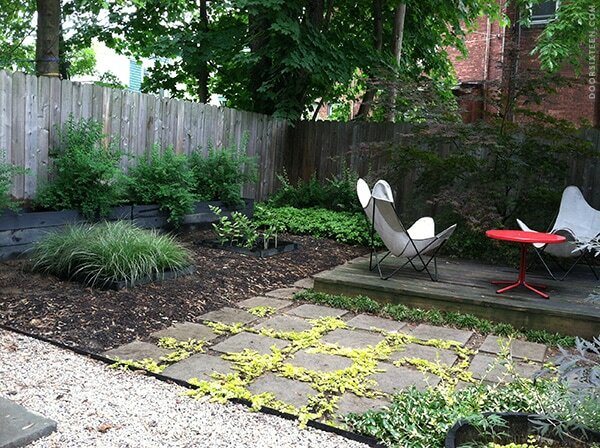 The stuff between the pavers is creeping Jenny. I do love plants, and perennials do have nice colors too, because I’m lazy I’ll write the Swedish name of some of my favorite perennials, that I use, maybe your mother could translate… Anyway, Bergenia, if you like pink, great, hardy, wintergreen with pink flowers in spring. Akleja, I love them, my father calls them weeds. Jättedaggkåpa, if you call lime green a color that is not green exactly. Pion. Astilbe. Rudbeckia. Löjtnantshjärta. Kransveronica. Kärleksört. Not that there is anything wrong with green, if I could decide all on my own I would have gone for mostly green, with some white and black flowers (there are black Akleja, I have some seeds I never get around to plant). But, there is a husband and a daughter to consider too, they like colors, so they get pink flowers, and some blue. And that’s nice too. Do not mean to push anything on you, but you know, long winters and short summers here, I get a little overenthusiastic when I can talk about plants! Especially now, in the summer. Oh MAN. Your backyard is looking mighty sweet. It completely blew my mind especially when I saw all the before photos. You guys did an awesome job. Mad props. I was excited to finally see what Solomon’s seal looked like! I’m rather fond of it as a tea but had no idea what the plant looked like. I just read up on it and the tea is made from the roots of the plant. It looks wonderful, Anna. Truly. Job well done. Perhaps one day Nicole and I will come visit and sip iced coffees with you on that lovely deck! Anna, love your butterfly chairs (AND the yard)! Do you leave your chairs outside all the time or bring them in when not in use. Mine are dark purple. Leaving them out means they actually get used more which I want, but I worry about leaving them out all the time – fading, collecting water in the rain. I know the covers can be replaced fairly easily/inexpensively so maybe it’s not awful if they do get damaged. Just curious. 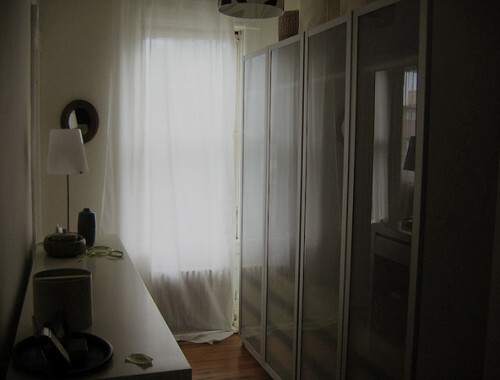 Marcia, I bring the covers inside at night, but the frames stay outside. I love the look of the little plant you have between the stepping stones, but I’m curious: Is that meant to be trimmed or will walking on it just naturally keep it in check? Creeping Jenny doesn’t really grow across the top of stones, it just meanders between them. I’ve never had to trim it — I’m just waiting patiently for it to fill in all the gaps. This is as tall as it gets, though…it just spreads wider. i love that red side table. can you tell me where it’s from? thanks! 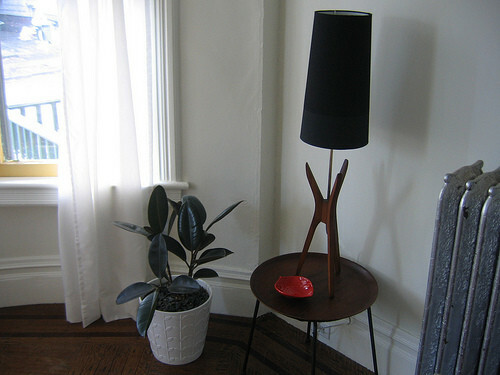 It came from DWR years ago, Drew — I don’t think it’s still in production, unfortunately. That Loropetalum Chinense looks so happy there. I just looked that up, and I’m pretty sure it’s not growing in my garden! Are you looking at the fireglow Japanese maple in the back corner? YAY! It looks lovely! 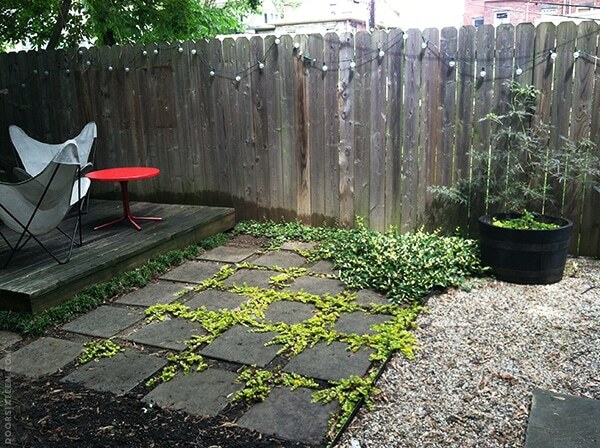 The creeping jenny is such a good hit of acid green in the space. And those grasses are going to fill out so awesomely. Anna, in the years that you’ve been a beacon of inspiration to all of us, I don’t know that you’ve ever called anything done. Have you? As a fan, it is gratifying to see you, the hardest working human being I don’t actually know, give yourself this laurel. You are done! Mazel tov. Haha! That “hard working” thing is all an illusion, Kiki. 😉 I might not have said it, but I definitely consider both of the bathrooms in my house DONE. The rest of it, though…it’s all forever in progress! We have Solomons Seal as well, I love it, very subtle. Just one or two in a vase looks very elegant. They smell lemonny and fresh. I was taught that they are related to Lily of The Valley and therefore poisonous, so the tea comment surprised me. Some suggestions: Anemone “Honorine Jobert” or something like it, has a maple leaf like low foliage and flowers (beautifully) end of september start of october, great way to lengthen your summer. Viburnum placatum, can survive really heavy winters (we had -22 celcius two winters in a row) good in shade and gorgeous all year long. Ferns. It looks great, have a wonderful day. 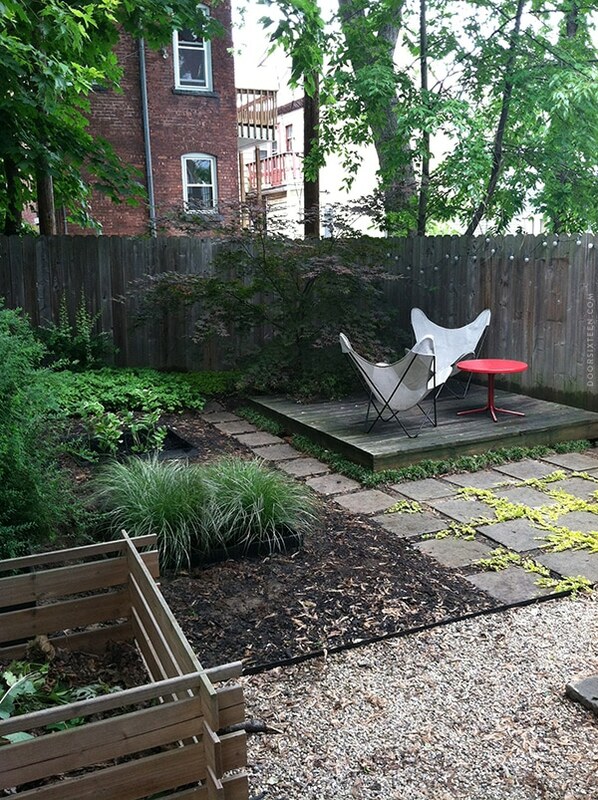 A garden is never done…i’m willing to bet you will keep finding things to add, rearrange or take away. It’s a wonderful way to invest your time. Your yard looks fantastic! Just curious how well your butterfly chair covers stay clean? We just got a vintage butterfly chair off of ebay with a white cover, but I’m thinking of using a black one instead. Although I would prefer to use the white or natural cover. Your garden looks really great. Just wondering if you lay the stones yourself or hired a professional.